In the Git flow development model, you have one main development branch with strict access to it. It’s often called the develop branch. It takes some time to agree on a final version of changes. Once it’s agreed upon, the pull request is accepted and merged to the main branch. Once it’s decided that the main branch has reached enough maturity to be released, a separate branch is created to prepare the final version. The application from this branch is tested and bug fixes are applied up to the moment that it’s ready to be published to final users. 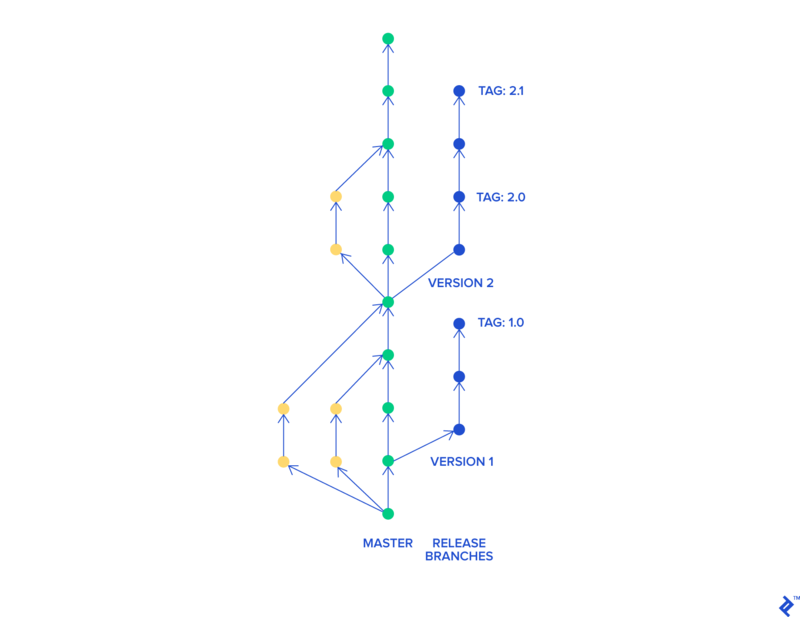 Once that is done, we merge the final product to the master branch and tag it with the release version. In the meantime, new features can be developed on the develop branch. In the trunk-based development model, all developers work on a single branch with open access to it. Often it’s simply the master branch. They commit code to it and run it. It’s super simple. In some cases, they create short-lived feature branches. Once code on their branch compiles and passess all tests, they merge it straight to master. It ensures that development is truly continuous and prevents developers from creating merge conflicts that are difficult to resolve. This style of work can be great when you work with a team of seasoned software developers. It enables them to introduce new improvements quickly and without unnecessary bureaucracy. It also shows them that you trust them, since they can introduce code straight into the master branch. Developers in this workflow are very autonomous—they are delivering directly and are checked on final results in the working product. There is definitely much less micromanagement and possibility for office politics in this method. In the world of software development, "trunk" means main development branch under a version control system. It’s the base of a project, where all improvements are being merged together. What is code branching and merging? Branches are created from the base project, in order to develop a new feature, fix a bug, or simply do some refactoring. They prevent software developers from disturbing each other and enable them to work in parallel. Once a change is finished and tested, the branch is merged back to the trunk. What is a branch in version control? A branch in a version control system is a duplicate of the base project. It’s created so that changes can happen in parallel across other branches. It essentially solves the problem of working on the same files at the same time. What is a feature branch? 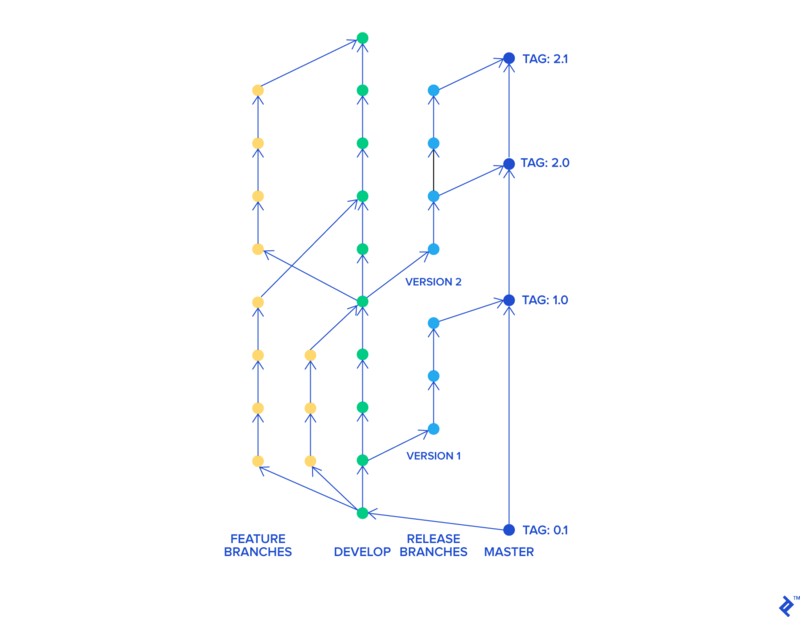 The feature branch has a clear and highly-focused purpose—to add specific functionality to a project. It shouldn’t contain any other changes that fix bugs, introduce other features, or are part of a refactoring. Version control systems trace changes occurring in files in a project. They can be recalled or reviewed later. It’s extremely useful for bringing back previous versions as well. This allows developers to find bugs with less effort, as they can see and track all the changes as they occurred. Nice article. I'd just like to add that git flow is useful even if you don't use pull requests. For instance, only junior devs would be required to pull request, where senior devs merged freely and were responsible for versioning. I find that many of my projects tend to be a bit of a hybrid of the two. Don't you merge the patches applied in the release branch back to develop branch? Yes you do. There should be merge back to develop branch on attached flows. Thank you for catching that. There are all sorts of variations of those styles. I just described the two most common. It's always good to experiment and find flow that suits you best. Does anyone have any thoughts on a workflow that would allow a team to drop a feature in development? One challenge I have seen is with commits that, when the project changes scope, are no longer desirable, but may be again in a future release. It appears, to my eye, that git flow best supports this. Trunk development seems to work if the team is confident that every feature in development will get released (next). Thoughts? It might be beneficial to research "Feature Flags" or "Feature Toggles" - enables you to deploy features "dark" so they will not be enabled, but the code still remains in place. Take that and pair it with trunk based development. Releases will be much better. If you release a feature and there's an issue with it, you can turn off that one feature without even rolling back your code, leaving the rest of the working features in place, continuing to add value to the organization and your feedback loop. GIT ----- Seems like author does not used git or github properly. I would like to address mentioned git problems as per your view, can resolve easily with git itself. When you are just starting up. Nobody forcing you to create PR for every change, its one in many ways to apply commits. If you are a beginner and want to directly commit to master, nobody going to stop you. PR is a standard way for communication, collaboration & documentation of feature When you need to iterate quickly. iterations can be created via feature branches until customer satisfied. git commits/patch are for the changes. [Use Revert/Drop/Fix/Squash/Rebase/Merge wisely] When you have established product or manage large teams. Git/Github is the proper repo for large and distributed teams. When one project growing large there must be some standard to follow. Like having proper test cases for each and every functionality, unit cases. Run test and build (CI & CD) on development / production branches, rebase branch with latest etc. Seems to me like you might not have that much experience yet. Everyday reality for many software developers is that their employers or supervisors are forcing them to create pull requests for every change, even the smallest one. I personally worked in a company where committing to master was physically locked and the only way to push your code to production was through pull requests. Obviously both styles or their variations can be applied in any situation, fact of the matter is that some fits better in certain cases. Lock master is a protected way where no trust exist (Say by means of security and common in Standard companies). I have contradiction to your comments on negative side of git , but those drawbacks are not exists in git as far as I knew of. May be its your illusion. FYI -> Working with git/github around 6 years. Excellent overview! Enjoyed reading it. Thanks! The author is not arguing against GIT (nor Github); he is talking about two developments models when using *git* and which one is better for each situation. You can protect branches, and maybe you can hack around to push to master or development (I don't know about that), but if your team/company blocked you from pushing directly to those branches they wouldn't be happy when they find that they have unauthorized code in one of the protected branches. Then you might get fired. Loved the way you explained both developments models . Thank you for this article.. The assumption that pull requests (PR) are not that needed or useful for seasoned developers is arguable. It's true that developers with lots of experience will move faster as they know the development process and what qualifies as a better solution most times - but not always. It would be hard for someone to write the best code solution for every problem. In my experience, PRs, as a team effort or even as a solo effort (one opens a PR and review his/her own code) - have always improved the codebase as a whole. In other words, iterating and incorporating comments from others take a bit more time but drives up the quality of the code. But I understand the point of view of the author as balancing the team output and code quality is really hard. Do you have a reference for gitflow implying pull requests or code reviews? Just curious, I dont see them in the original git-flow post ("A succesful..."). Right, git-flow doesn't imply pull requests, and conversely TBD doesn't imply not doing PRs. You can do TBD via pull requests - just means that each developer has to make at least one pull request per working day, and therefore the PR won't always provide a new feature - it might just be some preparatory work that will allow a feature to be built later. I agree with you, we are humans, we all make mistakes even if we have a lot of experience, checking PRs between the team, reduce our errors, improve our code and sometimes even teach us something new. Great article. Have you updated the graphic to reflect this change? i.e. the merge back to develop from release? You have a very limited understanding about this topic, but rather harsh voice. Here the gitflow and trunk based development pro and cons is dicussed. Very nice post and interesting topic. What’s interesting is that the benefits you site—“They greatly speed up work and give us the ability to find bugs more easily”—are competing aims that are often at odds with each other. 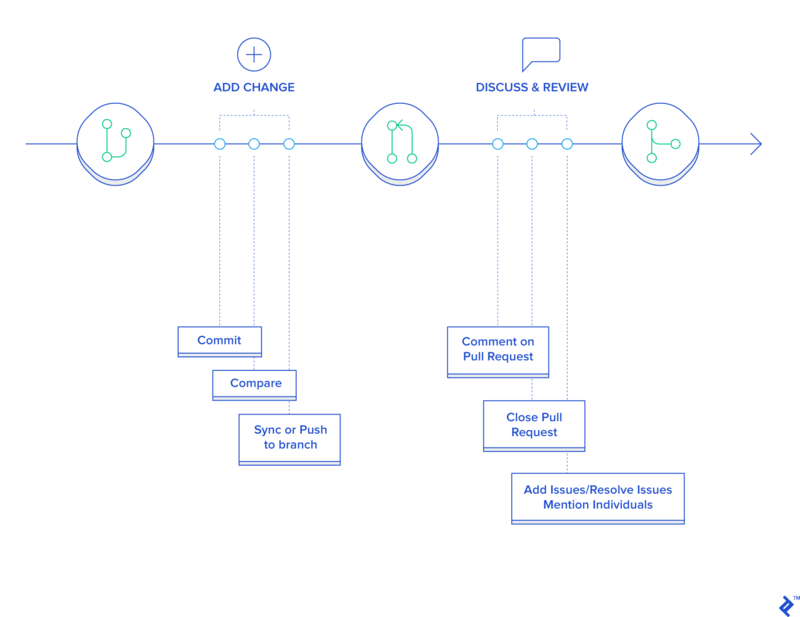 I think the gitflow/ pull request workflow, based upon task-level feature branches, is much more likely to surface newly introduced bugs, but is much slower and surely less gratifying for developers. In most organizations that aren’t specifically focused on software, and especially in any industry that is governmentally or professionally regulated, this level of checking and approval is mandatory. I also firmly believe that many problems in software development aren’t even “code” problems, but are rather things like cognitive errors, communication issues, misunderstandings, and regulatory compliance. These are much easier to address in many small tasks (where acceptance tests would exist) rather than fewer and larger strategic epics (although not discussed, the git workflows and project management workflows must be in close alignment, if not completely parallel). At Zivtech we normally take a hybrid approach, committing to master directly during pre-launch phases of a project, and moving to an approval process with PRs later, once the site or app is live, after which everything goes through prs.